The world-famous Philadelphia Museum of Art - located at 26th Street and the Benjamin Franklin Parkway - is usually described as one of the Benjamin Franklin Parkway attractions - which is logical, obviously, given its location. But the Museum of Art is also often described, as being part of Fairmount, which, due to its location at the northern end of the Parkway, it is. It enjoys sort of a dual citizenship in both areas. 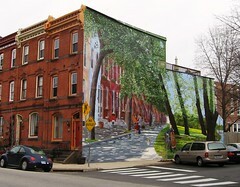 As we discuss on the Fairmount Main Page, the neighborhood is sometimes defined as "Fairmount / Art Museum Area". We would recommend these two major Philadelphia tourist attractions to be done in conjunction, on the same day, due to their proximity. You can go by cab, or by foot. The cab ride will be short, if you can get one from the Museum of Art. (It will be harder to get one from Eastern State Pen.) If it's after dark - take the cab. Basically, when you come down from the Rocky steps - you need to find Pennsylvania Avenue, which runs parallel to the Ben Franklin Parkway. (Surprisingly, Pennsylvania Avenue is not a major artery in Philadelphia, in spite of its name). Basically, you want to reach the intersection of Pennsylvania and Fairmount Avenues, and to head east on Fairmount Avenue. You should cross an intersection at either 25th and Fairmount or 24th and Fairmount; if the numbers are going down, you're going the correct way. The prison's western border is at 22nd Street and Fairmount Avenues. You can't miss it, of course - it's the gigantic castle. If you are from out of town, this is the right move, especially at night. Cabs are plentiful at 30th Street, Rittenhouse Square, and Suburban Station. Often, the purple Phlash trolleys are the best way to get somewhere in central Philadelphia. However, they are not the best answer for Fairmount, for three reasons. 1) Regrettably, the Phlash has not fully incorporated all of Fairmount into its standard route. 2) It only runs from May 1 to October 31 - the end of heavy visitor season. 3) It stops operating around 5:30 PM - 6 PM, depending on the stop - and there's a lot of nightlife in Fairmount. You can take the Phlash to get there, but you'll have to cab it back. However, the Phlash does have four stops you can use to travel to Fairmount, with three stops surrounding the Art Museum. Stop #13 is at Fairmount and Pennsylvania Avenues, which is the closest stop to Eastern State Penitentiary. Stop #14 is the back door of the Art Museum; Stop #18, the front of the Art Museum - the Rocky Steps and Rocky Statue. In addition, there is stop #12, at the Rodin Museum, which is at 22nd and the Parkway. If you walk directly north on 22nd for six blocks, you reach Eastern State Penitentiary. You can take the Broad Street Subway to its Fairmount stop, but - under no circumstances - should you try that, unless you're a local and you're very familiar with the area and geography. You don't want to get lost, near Broad and Fairmount Avenue, the location of the Orange Line stop. A much better idea, if you happen to be near Broad Street, is to travel to the Orange Line stops at either City Hall Station - located at Broad and Market Streets - or its Race-Vine Station, which offers you the choice of Broad and Race Streets or Broad and Vine Streets. From City Hall, you can follow the directions for the Phlash, SEPTA buses, on foot, or a cab, to Fairmount. From Race-Vine, just head west on either Race or Vine, until you reach the Ben Franklin Parkway. From there, likewise - the Phlash, buses, on foot, or a cab. If you're walking, make a right turn at the Parkway and head toward the Museum of Art. The SEPTA Blue Line has a stop at 15th Street Station, which takes you to the intersection of 15th and Market Streets. But from there, you need to connect to SEPTA buses or the Phlash (when the purple trolleys are in season, from May 1 through Halloween), or a cab. The SEPTA #7 Bus is your best bet from Rittenhouse Square, or anywhere that crosses 22nd Street in Center City. The 7 bus runs northbound, up 22nd Street, directly to Eastern State. Coming back to Center City, it runs southbound down 21st Street, until it reaches 21st and Market Street. It then turns right, and continues to run south, but down 23rd Street, instead of 21st Streets. The SEPTA #32 Bus is your best bet from Suburban Station, or from either the Blue Line 15th Street Station or the Orange Line City Hall Station. If you are visiting Fairmount, from the Pennsylvania or New Jersey suburbs, or from the distant outskirts of the city, you may want to try a combination of SEPTA Regional Rail - and then either walk, take a cab, the Phlash, or a SEPTA bus. Most inbound trains will stop at Suburban Station - which is located at the intersection of 16th Street and John F. Kennedy Boulevard. If you are traveling to Philadelphia via Amtrak, the odds are overwhelmingly high that you will be disembarking at the architecturally impressive 30th Street Station - which is Amtrak's major gateway station to the Philadelphia region. Although your Amtrak ticket is good - on the same day - for a trip to and from either Suburban Station on Market East Station, you would best off taking a cab to the Museum of Art, Eastern State Pen, or the nightlife in Fairmount. You would waste too much time going to Suburban and then having to get all the way up to Fairmount. And you can get a cab easily at 30th Street - just step outside. It's not an expensive cab ride. You can walk to Fairmount, from anywhere west of Broad Street in Center City, although you should be advised that it's a long walk. For example, from Logan Circle - which is around 19th Street and the Ben Franklin Parkway - it's about a one-mile walk. In terms of navigation, it does maintain the same grid layout as Center City, so once you're on one of the numbered, north/south streets, you can keep going until you reach Eastern State Penitentiary, for example. Exercise great caution, though, as in any urban area. You are going off the main tourist path and it's not as well-signed as Center City, especially at night. Don't get lost. Take your map and familiarize yourself with where you're going, before you start. The major difficulty you will encounter, in trying to drive to Fairmount, is that the residential neighborhood doesn't have many commercial lots, and its population density (and thus cars) is very high. It can also be confusing, since there are many narrow streets, and Eastern State Penitentiary occupies such a big part of it, and you have to maneuver around it. Another downside is that if you're there at night - and that's a popular time to be there, due to the nightlife - you may have to wander around the neighborhood, trying to get from the bar back to the car, and that could be dangerous, especially if you're not familiar with the geography. So - if you're visiting from out-of-town, take SEPTA and/or a cab. Don't bother with the car. But if you can get parking on the street (and there is some parking available on it) and you're a talented parallel parker, you can give it a try. If you'd like to leave Traveling to Fairmount, and return to the Fairmount Main Page, please click here.